I see five big advantages with buying and holding San Antonio investment property. Most investments offer either a regular return or appreciation. San Antonio real estate investments offer both! A really good buy and hold investment property, such as the one on Wagner St. listed below for an under market value price of $49,000, offers strong positive cash flow that offsets my expenses and any debt. It also provides me a nice monthly income. If you read much about me on this website, I financially retired at 28 with more than $20,000 in monthly cash flow. Almost all of that was and is from San Antonio buy and hold investment properties. I do a flip now and then, but I much prefer steady $700 per month cash flow from lots of San Antonio fixer uppers. Fixing and flipping in San Antonio is well and good, although it is harder to do in this appreciating market. I can tell because flippers call me wanting properties for .50 on the dollar! Yeah right, not in THIS market! The great thing about buy and hold property is that the IRS lets you write off depreciation on the property over 27.5 years. This is ‘negative’ income but it’s just negative on paper, which helps my tax situation. If you have a mortgage on your San Antonio investment property, the cash flow lets you pay the mortgage without spending your own cash. And, each month, part of your principle is paid down. About 20% of each loan payment increases your equity in the property. You can then borrow some of that capital if you like to buy more investment properties. Buy and hold investment properties can appreciate in value depending upon the state of the market. Most of my under market value fixer uppers in San Antonio appreciate at 3-4% per year. During the last crash, most of my properties did drop in value, but I was still able to have positive cash flow from them. I was even able to increase rents on some of them. I am mostly a cash flow investor anyway; appreciation isn’t a big deal to me. If you put $20k into stocks and it increase 10% in value, you make $2000. Not bad. But if you put 20k into San Antonio investment properties, you can buy a $100k fixer upper with an 80% loan. If it goes up 5%, you made $5000 with only $20,000 invested! Even if stocks have a higher return, it doesn’t matter because real estate returns are based on much more than the principle you invested. If you are interested in San Antonio buy and hold investing, here is a great 15% or so ROI deal to get rolling. San Antonio Wholesale Property Address: 1515 Wagner Ave. San Antonio, TX 78211. Description: Location Location! Cash Flow! Under market value, 3 beds 1 bath, 816 sqft, built: Lot Size: .14 acres, Yearly taxes: $600.00, Estimated yearly insurance $700.00, Estimated repairs: 15K, includes interior paint, electrical/plumbing up to code, landscape, trash removal, kitchen/bath updates, flooring, roof repairs. 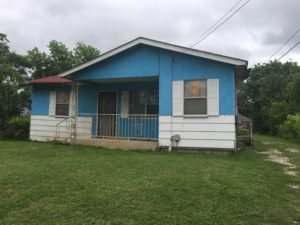 Exit Strategy: Rent San Antonio investment property with 15K in repairs: $850-$900 per month — or Owner Finance with 15K repairs: 5k down, $900.00 monthly P/I, 30 year amortization, 10% interest, Price: 89K. 15% ROI is possible. Next PostNext How Long Should I Hold My Buy and Hold Investment Property?